Over the last few months I’ve been developing a brand new one way link building system. A system that will make it extremely easy for you to obtain relevant one way backlinks to your sites. Although the system does not actually place links on websites, it does just about everything else for you and provides tracking and statistics on all your link building campaigns. So, how does this system work? Ok, I’ll explain. Basically you add two groups of websites to your account. You add money sites which are your main money earning sites. These are the sites that you want to retrieve backlinks for and to give a boost in the search engine rankings. The second group of sites you add are linkout sites. These are other websites or blogs which you have that you are willing to place links on that point to other members money sites. These may be informational sites or adsense sites, or any sites that are not your big money earners. There are no limits to the amount of sites you can add. You must though add a minimum of one site to each group. The more linkout sites you add, the more backlinks you are likely to get pointing to your money sites. 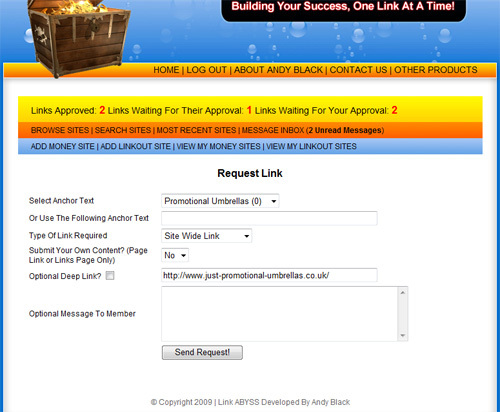 For every site you link out to via your linkout sites, you will get an inbound link for one of your money sites. Here are some screenshots that will give you a peak inside Link ABYSS. This is your main admin panel. From here you’ll be able to access all areas of Link ABYSS. You can also update your account to receive email notifications as well as activate / de-activate your account. You would de-activate your account if you won’t be able to log in for a few days, are on holiday or are inundated with link requests. Simply add your money sites, one at a time. You can add three anchor texts to each site. The system will keep track how many live links you have for each of your anchor text. You can change your anchor text at any time by updating your money site. Add your linkout sites one at a time. Give each site a title, choose a category, add your related keywords (this would also include related keywords for closely related niches), set numerous linking options and then add any relevant notes (optional) for other members to see relating to your site. Browse or search relevant sites to obtain backlinks from. The search facility as being added shortly and you’ll also be able to view ‘Most recently added sites’, which will be ideal to quickly see all the latest linkout sites within the system. Great if you only log in once every day or two. 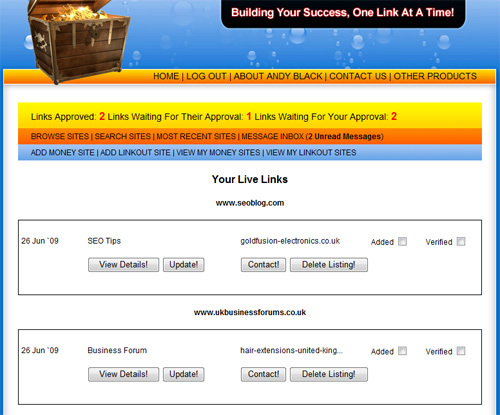 When browsing sites it will automatically tell you how many pending and live links any particular site has. You can then click on a sites title and it will display all the sites available linking options along with other stats such as page rank etc. 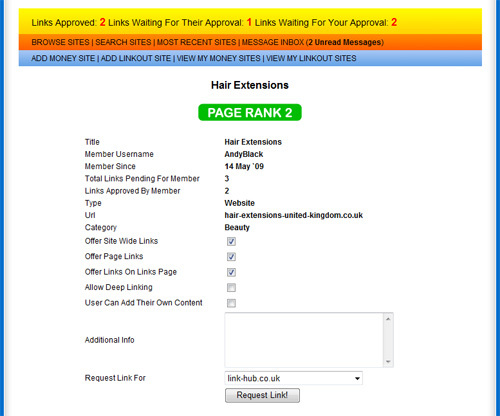 If a site is suitable simply select one of your money sites from the drop down menu and click ‘Request Link!’. Once you have chosen to request a link, the system will display a number of available options. You can select your anchor text or even choose a custom anchor text. If you choose from your anchor list it will tell you how many live links you already have in the network for each one. If the options are available for a specific site you’ll also be able to choose what type of link you request (site wide, link on an inner page or link on a dedicated links page). If a site isn’t closely related to your site you may want to request a link on a links page. You can then choose to submit your own content or article to include your link within and even select whether your link url will be to your main index page or to a deep link within your site (inner page). On top of these options you can also include a note to the members. As soon as you finalised your link request, it will instantly appear in the other members ‘Approval’ panel and also in your ‘Waiting for members approval’ panel. The member can quickly view and evaluate your website and if all appears ok he will click ‘Proceed to step 2!’ which will take him to the following screen. 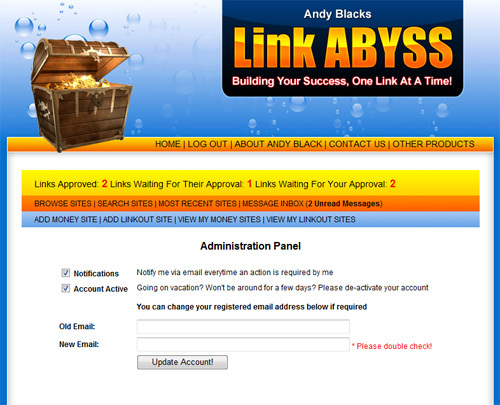 The member then gets to choose one of your link out sites to obtain a link from to point to one of his money sites. 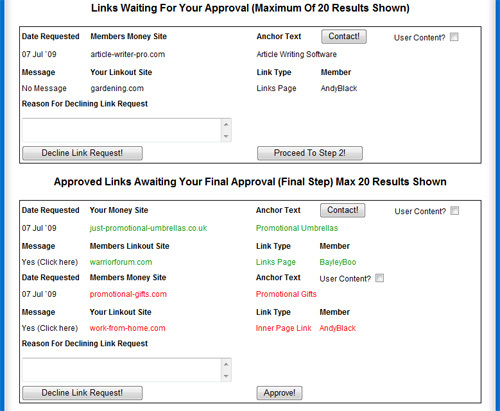 At a glance, this screen will show him all the linking options you allow on each of your linkout sites. If he clicks on one of your titles your website will open up in a new window for quick appraisal. He can then select which of his sites he’d like a link pointing to and then click ‘Proceed to final step!’ He will then quickly select his options and click ‘Request Link!’. This will then send a final approval request back to yourself. If you agree to the members return link request you simply click ‘Approve!’ as shown in the screenshot above. This will then create a new record in your Live Links panel. You can view your live links anytime you wish by clicking on the link in your navigation bar. You can choose to view the full details from here, update or even delete the record from your account. 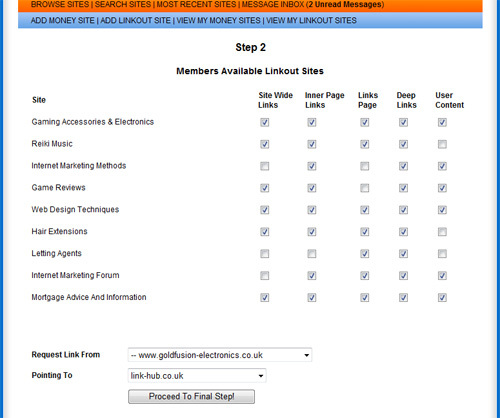 As soon as the member has added your link to their site he will update the link request from their ‘To do’ panel. This will AUTOMATICALLY update your record showing that the link has now been added. You would also do the same. Once you have clicked through to the supplied url and checked the link is present you simply check the verified box and update the record. I am looking at adding a feature to the site shortly which will scan through all your live links and automatically check that ALL links are present. You could then run this periodically to check members are still linking to your sites. If they aren’t you can delete their link or contact them to find out why using the contact feature. You can view stats on your money sites at anytime. It will show you how many pending and live links you have in the system for each of your money sites. You can view stats on your linkout sites at anytime. It will show you how many outbound links you have including a break down of the different kind of links. The screenshot above shows you your inbox. The system has a complete internal messaging system built into it. This allows you to message other members regarding link requests. This can be to ask questions or to arrange an amicable link request that you are both happy with. There are other features being implemented into the system but they aren’t quite ready yet. So, when will the site be launching? The answer is soon. The system should be finished within the next week or two and will be made live for testing. The testing period will include some of my existing members and will take place over 3 -4 weeks. After this beta testing stage the site will be launched and opened up for new members. How much will Link ABYSS cost? I’ll be sending one or two updates out via my newsletter over the next couple of weeks. One of these will include prices. I will say though that this system will cost MUCH less than other link building systems / networks out there. 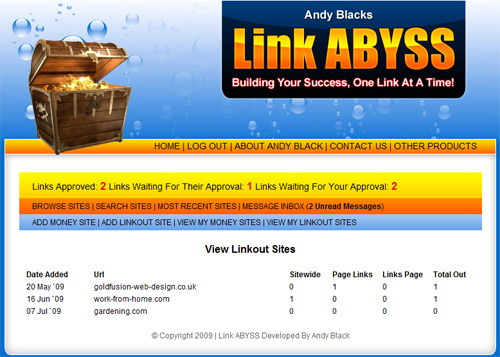 Link ABYSS will be priced to make it a very valuable weapon to add to your link building arsenal! I will be offering the first 500 memberships at a steal. Then the price will be increased slightly for the next 500 memberships before it goes up to it’s full price…. which will still be a steal. Upon launch it will be on a first come, first served basis so if you’re interested in joining this network you’ll need to act fast. As always, please feel free to post a comment below. It will be great to hear your views and also answer any questions. Hey Andy, this sounds really good. If you are looking for one more tester definitely let me know. Hey Andy! I’m a member of your Article Writer Pro service and would love to be included to test it out. Hi Andy, this looks interesting and I look forward to trying it. Hi Andy! I have a membership to Article Writer Pro. I am really looking forward to Link Abyss. I need all the backlinks I can get. I do appreciate all your great products! This sounds like an excellent tool that is certainly destined to enhance the power behind Article Writer Pro. A real ingenious way of getting one’s site favored by the search engines. I’d love to be a proud owner of Link ABYSS. I do not understand anything about links. but I will join Article Writer Pro now so maybe I can learn about the link system later.